With both the Tampa Bay Lightning and Chicago Blackhawks heading into Sunday’s game on the second half of a back-to-back, it should be a more evenly-matched affair. Both teams needed to travel to Chicago on Saturday night after playing difficult games. The Lightning found their first period legs Saturday night in Minnesota, striking early and often, dominating the period. However, they took their foot off the gas and the Wild pushed back, capitalizing on their few opportunities to eventually put away the Bolts in overtime. The Lightning will put the sting of another loss in Minnesota behind them, and luckily, it will be a quick turnaround. Vasilevskiy (for the most part) was solid, they didn’t take as many penalties, remain perfect shorthanded, and continue to get offense from all areas of their lineup. However, they really need to figure out their power play. Tampa Bay had five opportunities to score on the man advantage, and only broke through once. Playing a weaker shorthanded team like Chicago is the perfect opportunity to really get their powerplay going, but they won’t be playing struggling teams forever. 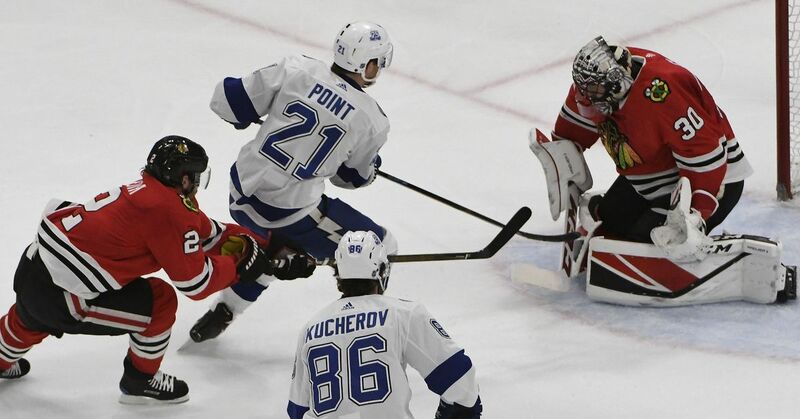 The Blackhawks also have the fourth-worst power play in the league, so the Lightning’s stellar penalty kill may remain unblemished through the weekend. Anton Stralman took a puck to his neck in the third period, but returned to score one of the prettiest Lightning goals so far this season, and send the game to overtime. Barring any complications, expect him back in the lineup Sunday night. Aside from Louis Domingue taking over for Vasilevskiy, the Bolts lineup should remain unchanged. The Bolts will need another strong game from Domingue, who stopped 38 shots against Carolina for a 4-2 win in his only start this season. Meanwhile, the Blackhawks tangled with the Columbus Blue Jackets, emerging victorious on the back of Corey Crawford, who won his first game since last December. Despite what the score might have indicated (Chicago won 4-1), they were severely outplayed by Columbus, who hammered 76 shot attempts towards the Chicago net. Crawford showed no signs of rust on Saturday, stopping an impressive 37 shots and appearing to be in midseason form. Thankfully, he’ll get the night off when the Lightning arrive in town. However, Cam Ward, who was Chicago’s starting goaltender until Crawford returned, has backstopped them to four wins this season. The Blackhawks have proven that despite falling off the contenders list, they remain a formidable offensive threat. Jonathan Toews has found his scoring touch once again, Patrick Kane is still an offensive wizard, and they went toe-to-toe a week ago with the then-scoring juggernaut Toronto Maple Leafs, scoring six goals in that game alone. However, they aren’t the strongest team defensively anymore, and need to rely on their goalies more than they should. Had it not been for Crawford’s heroics, it would have been the Blue Jackets picking up the two points. A couple of early-season injuries to Gustav Forsling and Connor Murphy have left holes in the Blackhawks blueline that they have struggled to fill. Henri Jokiharju’s emergence has been great, but it hasn’t been enough to solidify the defense core. Even though fatigue may be a key factor in the game’s pace, Tampa Bay’s speed should give Chicago’s slowing defense fits. Nonetheless, the Lightning will need a full 60-minute effort if they want to make up for the point they left behind in Minnesota on Saturday, but the Blackhawks won’t make it easy.